DonorSnap allows unlimited users. Each user can have customized security, rights, and screen layouts. Click the blue Add button to add a new user; click the Edit (pencil icon) to Edit an existing user. Note: These are not actual user roles or levels of a user. Instead they make it easy to start creating new users with predefined rights. 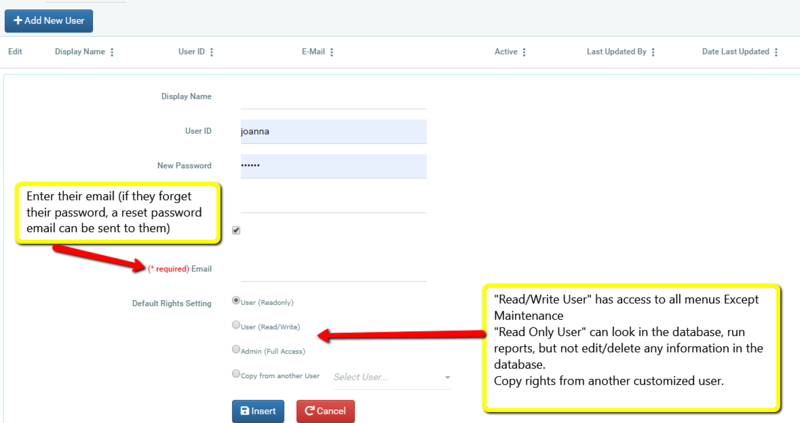 After creating the user with a predefined set of rights, you should further customize them as needed. To adjust the user rights, select the desired user and click the Rights tab. Select which pages and tools the user will have access to. For each tab, you must select which type of access the user has. Read/Write allows adding new and editing existing data. Read Only does not allow the user to change any data in the tab. Limit the contacts that this user has access to. 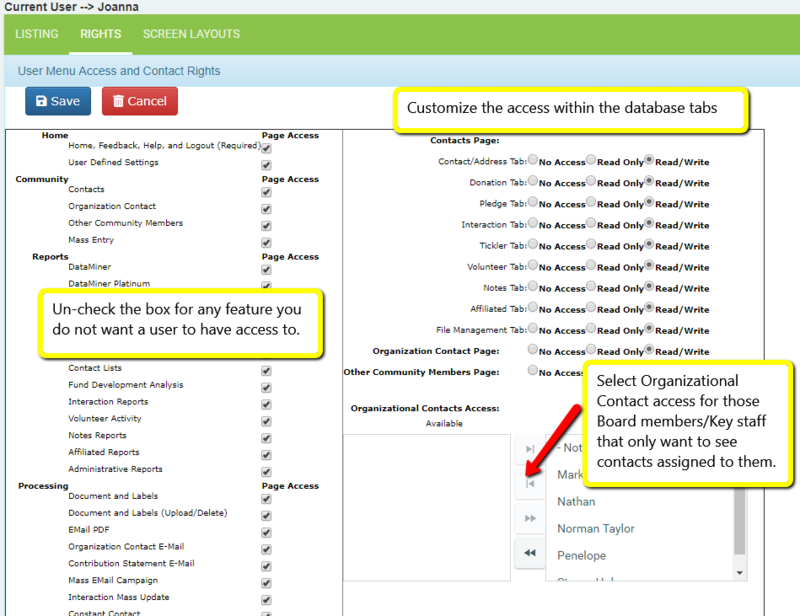 If you would like this user to be able to view all contacts, make sure that all available org contacts are moved to the “Selected” box. If you wish them only to have access to contacts linked to selected org contacts, move the appropriate ones over to the right box. NOTE: If you allow access to DataMiner Platinum, users will be able to view/export any information from the database using this tool. They will not be limited to the selected Organizational Contacts. Use the Screen Layouts tab to adjust field visibility for both the “grid listing” fields and the “page display/edit” (data entry) fields. Select either Grid or Page Display settings. Select which tab you would like to change in the second drop-down box. Move the fields you would like the user to have access to into the “Fields Selected” box on the right. 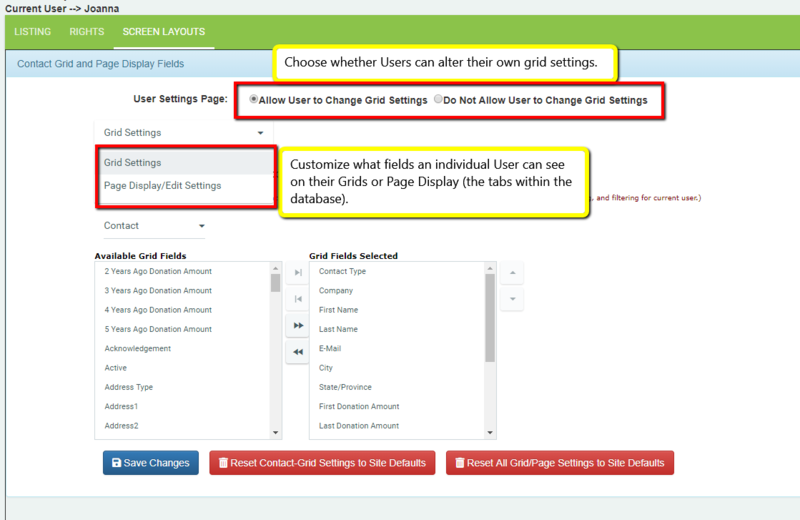 If you would not like the user to be able to change these settings, make sure you select “Do Not Allow User to Change Grid Settings” at the top of the page. Select this option if there are specific fields you would not like the user to have access to. Users can change their personal grid settings under Home > User Defined Settings.